Any Temple Run player knows the basic premise, and Infinity Runner does little to shake things up – instead delivering trial-and-error gameplay, dodgy production values and repeated set-pieces. As great as Doctor Who is, there's a definite kernel of truth in the joking criticism that its characters spend a lot of time running through corridors. Still, at least they've usually got some exciting or creepier-than-it-should-be-for-a-grown-up threat in hot pursuit. Infinity Runner's creator has clearly watched an episode or two and thought, 'That is a fantastic idea'. Perhaps it's the Welsh connection. There are a lot of corridors in this game. It is a game almost entirely made up of them. Endless corridors of the good spaceship Infinity for you to run though – see what they did with the title there? And run you do, automatically and in first-person, using the left trigger to slide under obstacles and the right to jump them. You use the right stick to turn corners, while the left lets you strafe from side to side, dodging the occasional hazard or picking up 'data packets', which you're told you must collect yet never informed why. Combat is a brief affair, involving one of a handful of QTEs to take out enemy soldiers. Oh, and you're a werewolf. Sorry, did we not mention that? Grabbing the occasional, unavoidable, pickup swaps you into 'wolf mode', in which the edges of your vision go a bit red, you attack all guards on sight and you don't have to do your own cornering. Essentially, it wrestles the bulk of the action away from you – in a game where you were already on rails. It feel the opposite of badass and empowering, a poorly implemented idea that could have added a nice tactical dimension were you able to deploy it at will to overcome tricky situations. The overriding impression is one of shoddiness. The graphics aren't what we'd expect from an Xbox One game, and the aforementioned corridors have clearly been designed in a modular fashion, in chunks ready to be bolted together. It's understandable, given the limited scope of the environments, but unforgivably apparent in many places. You'll have the corridors broken up by a room strewn with a tricky combination of obstacles. It'll take you a good few trial-and-error attempts to clear it, but once you've nailed it you're feeling pretty good. Then, in the next level, that exact same set-piece might pop up again wholesale. And that's not to mention the frequent stretches of corridor that repeat themselves, hazard for hazard, as if you're in a malfunctioning TARDIS. Weirdly, we found that the bulk of the challenge came in the game's first few levels, as we acclimatised to the controls. From then on, the only real difficulty increase comes in the occasional set-piece, in which what you need to do is in no way clearly telegraphed. Oh, so I need to veer left towards that flaming locker before I jump, in order to clear the tree at the other end of the room, do I? You really could have flagged it up, at least a little. The one exception being the final QTE of the end boss battle, which practically requires you to hit buttons even faster than the commands appear. And yet, it's somehow hard to really dislike Infinity Runner. When everything clicks and you snap into the zone, it's surprisingly easy to lose yourself in it. 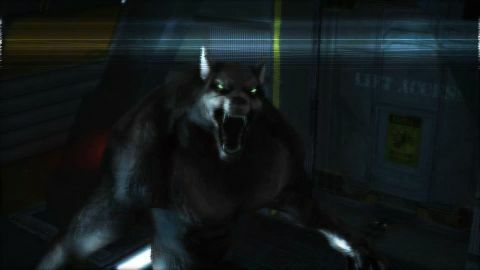 You can almost forget the flat voice acting, unsatisfying story and repetitive levels, because there's a certain primal pleasure in sliding perfectly under a laser grid or nailing that jump over a hostile fellow werewolf (yes, really). But make no mistake: if this were a Doctor Who episode, it would be a Colin Baker one. Description Can you escape from the ship and the werewolf that's hunting you?